One of the most popular bloods available. Realistic qualities include vivid coloring and medium flowing viscosity. 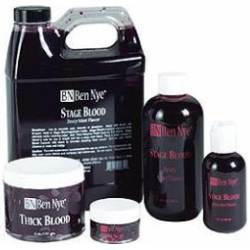 The director of "Aliens 4" chose our stage blood as the exclusive blood used in that film. Arterial coloring with a medium viscosity produces super realism. Safe in the mouth. Peppermint flavor! Washable, but it is best to test staining on fabrics and costumes prior to use. Sizes: .5oz., 1oz., 2oz., 4oz., 8oz., 16oz. and 32oz.